Description: Ariocarpus fissuratus is a geophyte plant that produces a star-shaped rosette of fleshy, deltoid to hemispheric tubercles, which have no spines and lie almost flat on the soil surface. They are usually solitary, rarely giving rise to side shoots from old areoles, they grow extremely slowly, to 20 cm in diameter. 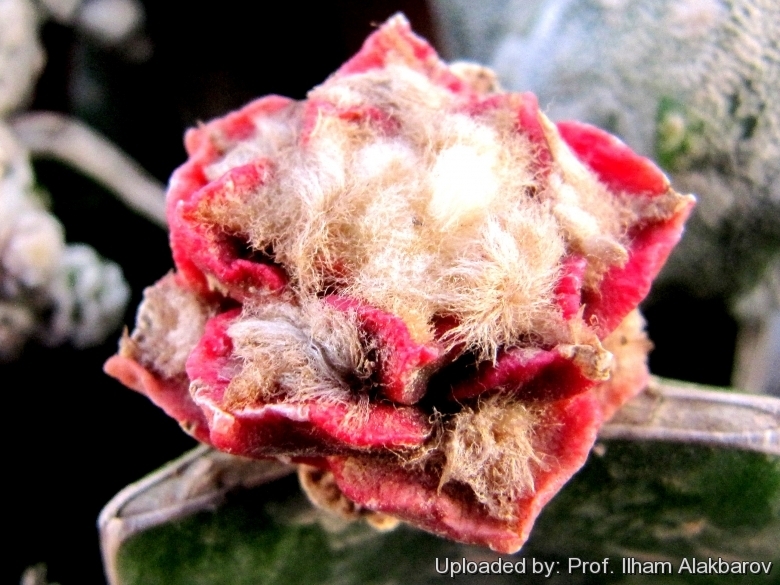 Forma rubra (red form): The red schizochromic form (Ariocarpus fissuratus f. rubra) has bright orange-red to deep purple stems due to the absence (or reduced production) of chlorophyll pigments: every other pigment is present at normal levels, the dominant green colouration is lost, but will still more than likely have normal other pigments that give the yellow overall appearance of the stem. This form with red stems is very attractive and highly prized. This schizochromic form is almost always seen grafted on stronger columnar species, and cannot can be grown on its own roots. Tubercles: The tubercles, about as long as wide, are closely packed and form a coarse mosaic. Exposed faces of tubercles, deeply fissured on either side of the central areolar groove, are coarsely rugose, and are often sharply angled apically; and with a lateral longitudinal furrow on each side of the tubercle, along the edge. Flowers: These plants have a woolly crown, from which emerge bright pink-violet flowers up to 2,5-5 cm, 2 times wider than long when fully expanded. Flowers last for 3 to 4 days. Fruits: white or green, with lots of seed.